26 October/November 2018 unmanned systems inside GROUND INNOVATIONS 3-D map the area, much like they did in San Francisco when the company began working with Delivery Guys. While they're still working out the de- tails of exactly what the process will look like, the Binkowskis are excited for what the technology will do for Oklahoma City, and are proud to be leading the way for other grocers with this partnership. THE BENEFITS FOR CUSTOMERS The Binkowskis hadn't really thought about incorporating driverless delivery into their business model until Susan Binkowski visited the Home and Delivery Expo in Atlanta earlier this year. Udelv had a vehicle on display at the show, and the team members who came along kept telling her she needed to check it out. She vehicle to meet them at a gas station, coffee shop or wherever they happen to be, making the service that much more convenient, Susan Binkowski said. With the AutoX service, customers can order fresh fruit and vegetables as well as other items through the mo- bile app, Li said. Perishables will be stored in a temperature-controlled environment throughout the ride. The company plans to expand their deliv- ery service every few weeks and will soon begin delivering a larger variety of items. To get started in Oklahoma City, where Udelv will soon begin deliver- ing groceries from various locations including Uptown Grocery, Buy For Less, Buy For Less Super Mercado and Smart Saver, the vehicles will first eventually did, and after talking with the CEO, decided these vehicles might be what the company needed to reach Oklahoma City residents who aren't able to easily get to a grocery store. "He (the CEO) explained the tech- nology and I just thought, oh my good- ness, how many more people could we reach," she said. "Our typical driver can only handle a certain amount of deliveries a week, if this one vehicle could complete 120 deliveries a day, we could literally have a grocery store for everybody regardless of location." 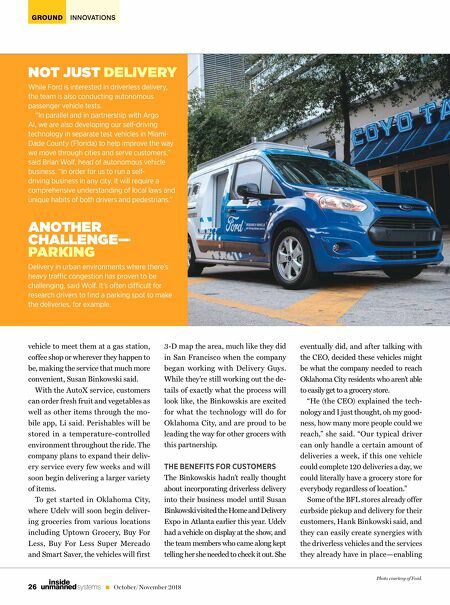 Some of the BFL stores already offer curbside pickup and delivery for their customers, Hank Binkowski said, and they can easily create synergies with the driverless vehicles and the services they already have in place—enabling NOT JUST DELIVERY While Ford is interested in driverless delivery, the team is also conducting autonomous passenger vehicle tests. 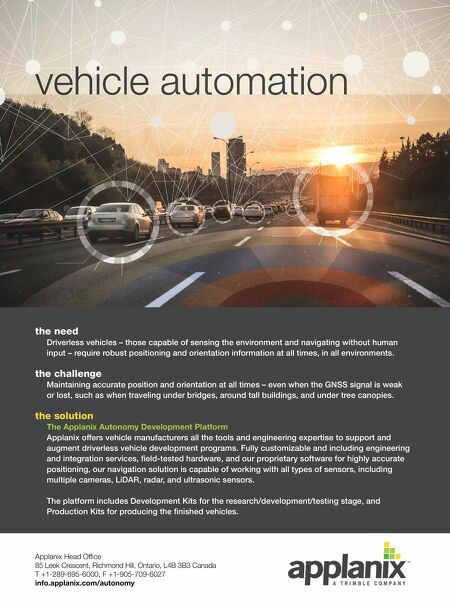 "In parallel and in partnership with Argo AI, we are also developing our self-driving technology in separate test vehicles in Miami- Dade County (Florida) to help improve the way we move through cities and serve customers," said Brian Wolf, head of autonomous vehicle business. "In order for us to run a self- driving business in any city, it will require a comprehensive understanding of local laws and unique habits of both drivers and pedestrians." ANOTHER CHALLENGE— PARKING Delivery in urban environments where there's heavy tra€c congestion has proven to be challenging, said Wolf. It's often di€cult for research drivers to find a parking spot to make the deliveries, for example. Photo courtesy of Ford.